If you have used Visual Studio for load testing, you may have experienced playback errors from a recorded scenario. This happens more often when you test a highly dynamic website or a web application with enhanced security. To resolve these issues, Microsoft troubleshooting instructions recommend performing manual correlation, including finding dynamic parameters and creating extractors. Unfortunately, the manual correlation process is difficult, requires experience, and does not always work. StresStimulus has the #1 auto-correlation engine on the market. It substantially reduces test development time and works with all web frameworks including the toughest-to-test applications such as Microsoft Dynamics CRM and Dynamics NAV. Until recently these benefits were available exclusively to StresStimulus users. Starting with version 4.8, Visual Studio users can also start saving time on developing web tests and extending testing coverage of applications that are difficult or virtually impossible to test. First, record your test scenario in StresStimulus. It will correlate your dynamic parameters automatically, reducing the amount of manual correlation required in Visual Studio by an order of magnitude. Then export the web test to a file and import it to Visual Studio where you can continue testing in a familiar and robust testing environment integrated into your company's application lifecycle workflow. Web Test Generator for Visual Studio provides a runtime module that ensures errorless test replay in Visual Studio environment and adds reliability to the testing process. 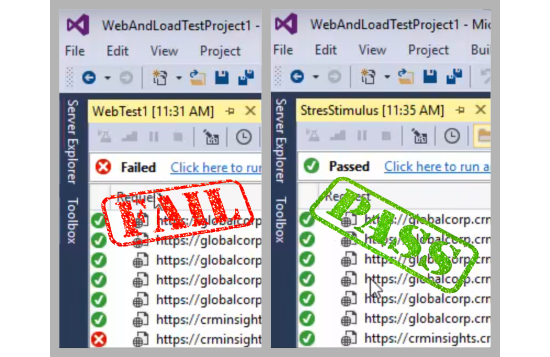 Watch how to fix Visual Studio load test replay errors with StresStimulus Web Test Builder or read this blog. While using the Web Test Builder for VS is already the easiest way to get your test to work, we understand that you should have the choice to save even more time. That’s why we offer the Test Configuration Service, so you can spend less effort on creating test script and focus more on performance testing. With the Test Configuration Service, we will configure and create an error-free script for your test case over a WebEx session. Best of all, it's guaranteed. If we fail to make your script work, we will refund the cost of the service in addition to the price of the Web Test Builder. Simply claim your refund within 30 days of license purchase. Web Test Builder for Visual Studio is available in StresStimulus upon its download. No trial registration or license activation is required to start evaluating it. Download Web Test Builder for Visual Studio registration-free, install it on as many machines as you need and start your proof-of-concept testing. Start your 7-day extendable trial with full support for end-to-end evaluation. We will even configure your first test free. Request a demo and one of our load testing consultants will give you a guided tour of how to eradicate your Visual Studio load test playback errors. Buy now and save time on resolving Visual Studio web test playback errors.